A traditional Martin-style ukulele featuring a koa or mahogany body, extended mesquite fingerboard, ivoroid binding and position dots, red/white/black purfling and rosette, and Grover Sta-tite tuners, the Palomino has an elegant appearance and a rich, mellow tone. 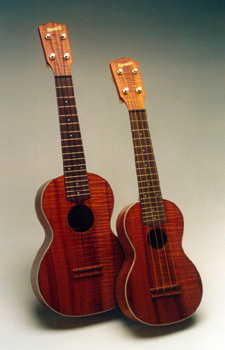 The Palomino is built light, like the old ukes, for maximum response and volume. 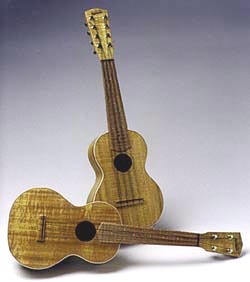 Available in standard, concert, tenor, or 8-string taropatch models.